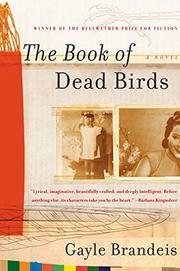 Korean folklore and ornithology figure in the lives of a former GI prostitute and her black fatherless daughter in an earnest, sad-funny debut, winner of Barbara Kingsolver’s Bellwether Prize. At 25, Ava Sing Lo lives with her mother, Omma, in San Diego, has a music degree, and feels crushing guilt about her ancestry. She also has an unfortunate history of accidentally killing her mother’s beloved birds. Wanting to surprise her mother by having the carpet cleaned, she destroys the parrot by chemical fumes; or, after refrigerating the robin eggs she finds in the kitchen, she learns that Omma was hoping to hatch them. In penitence, Ava enlists as a volunteer on Salton Sea to help the California brown pelicans that have been poisoned by pesticides. Meanwhile, Omma keeps a journal chronicling the long history of her daughter’s bird slaughter—it also functions as a metaphorical history of Omma’s inability to fly free of the curse of her past as a prostitute. In alternating chapters, while Ava adjusts to the stinking daily death of pelicans, the reader learns of Omma’s early attempt to escape her adolescence as a sea urchin diver on Cheju-Do Island: she runs away to her friend Sun, sings at a folk village, then at a striptease joint for black GIs. Known as Helen, and pregnant, she manages to get to San Diego as the fiancée of a white soldier, who then abandons her when the black baby is born. Brandeis gives enormously sympathetic qualities to both Ava and her strangely impassive and emotionally scarred mother. Too many elements, however, fight for ascendancy and resolution: murdered prostitutes washed up on the shores of Salton Sea; the sorrowful, desperate history of Helen’s and Sun’s lives as GI prostitutes; and the early massacre at Cheju-do in 1948. While the writing can be breezy and lightweight for such gravitas, the plight of the mother and daughter is still heartbreaking. In all, a wrenching tale exploring similar Korean-American identity as Nora Okja Keller’s Fox Girl (2001).